Give yourself the gift of clarity. Draw in your New Year! … then this program was made for you. I have totally done the Resolution Rollercoaster. The second half of December is that ka-chunk, ka-chunk climb up that first big hill. You’re anticipating the fresh new year, new calendar, new datebook or planner. You are anticipating The New You for the New Year. January 1, you are at the top of that peak. That first drop is exhilarating! Here’s all the energy rushing at you. Then gravity returns. You’re squished down by distraction, temptation, monotony, deprivation. You start to feel jostled and queasy. Far less thrilling now. You may be regretting the ride in the first place. Finally, you jerkily pull into the station. Not sure which end is up. Then perhaps you get back in line, waiting to do in all over next New Years. My own rollercoaster has always been getting super detailed, tactical, fussy and extreme in my resolutions. ALWAYS this, or NONE of that. Or daily details that I have NEVER EVER been good at. Seriously, by January 11 I have already broken the perfect streak of micromanaging myself I was expecting to keep up for 365 days. And those kind of resolutions are good at defining WHAT, but rarely include the SO WHAT? I need convince myself that the putzy WHATs are worth it. Years ago I switched gears and got off the rollercoaster. This program is all about my better way of acknowledging the time past and embracing the time to come. …And do so without beating yourself up. Reconnect with yourself, especially if the last few months have spread yourself thin. Create clarity for yourself that shines a light on where you go next! I do this by drawing. I get myself all cozy and quiet. With my January 28th birthday, I give myself a grace period until then to do this process. I don't have to compete with the official January 1st frenzy. I extend that grace to you too. Draw in your New Year is ready for you any time of year that you can use a reset. There’s not expiration date on these tools or this program. Come back to it any time you need it. I sit down with pristine piece of paper and markers and sit and ponder and squirm until I begin to figure out the shape of my recent past and how I want to shape the near future. The tabula rasa (blank slate) transforms into beautiful terra nova (new lands). Instead of you starting from scratch, I am sharing 4 of my favorite drawings for reflecting on the past and shaping your future. In Draw In Your New Year, I guide you through a handful of drawings that are easy-to-draw, but rich in meaning-making and insight. No matter what your level of drawing experience or penmanship, you can do this. 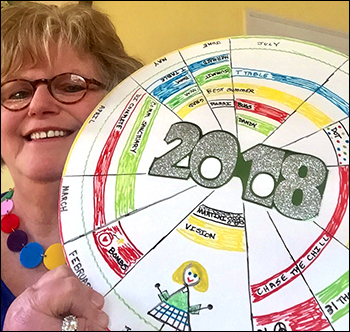 Thanks to Brandy's guidance, I created my New Year calendar wheel to show me exactly what needs to happen so that I can pop the cork for a champagne toast on December 31 and put a great year to rest. This class is full of so many great tips for gaining clarity as you define your next right steps for your life and your business. Watch the video at the top of the page for an introduction to the four drawings. 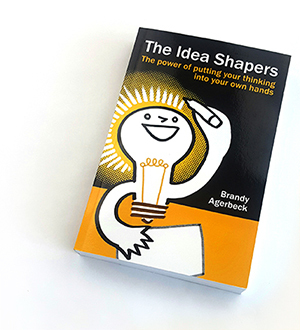 For those of you who own my latest book, The Idea Shapers: The power of putting your thinking into your own hands, you can see two of the drawings there! The Blue Drawing is what Christina draws for herself in The Objective (pages 60-64). The third drawing, the Orange one, is what Sue uses to reconnect with those people most important to her in The Connector (pages 188-192). In this program, I guide you through making four different drawings to create clarity for yourself when you need it. Each drawing is crafted to help you reflect on your recent past and harvest lessons learned and gather gems to take forward with you. You also will look ahead to your future to shape the personal vision that will support you going forward. Each drawings has a helpful structure that I guide you through. You take as much or as little time as you need to think, write and draw out your own insights. These videos are guided by me, but at your own pace. At different points you will ⏸️ pause the video to think, write and draw out your own answers. Then hit ▶️ play to resume the process. So many New Year's offerings are built around adopting a whole new systems, the shiny new planner, the productivity or time management tools. And there is a lot to gain with long-term change in habits. AND a lot of these systems don't stick, which is demotivating and frustrating. DIYNY is a standalone tool, a set of 4 drawings. They are available for you any time. The time commitment is 30 minutes to a few hours and depending on how much time you want to spend. And with that small investment of time, you can reap new perspectives, peace of mind, inspiration, insight and clarity. While I do hope DIYNY helps you draw more in your life overall, this program is DRAW + DONE. Finish the videos, finish your drawings and bask in the feeling of accomplishment. If you've gotten this far, I bet I'm preaching to the choir. You're already sold on this approach that is visual, spatial, hands-on. DIYNY is great excuse to break out your markers and pens (though you need very little materials to get the job done). A chance to make your reflections and ideas concrete and tangible. And if you're more of an auditory person, or someone who basks in text, maybe it's time to try a different mode and see what happens? You have lifetime access to the program so that you can come back to these tools any time they will serve you. I offer a no-questions-asked 30 day money-back guarantee. Simply email me and let me know you want a refund. Once your registration fee is refunded, you lose access to the members area and the recorded content. Hope to see you in Draw In Your New Year. 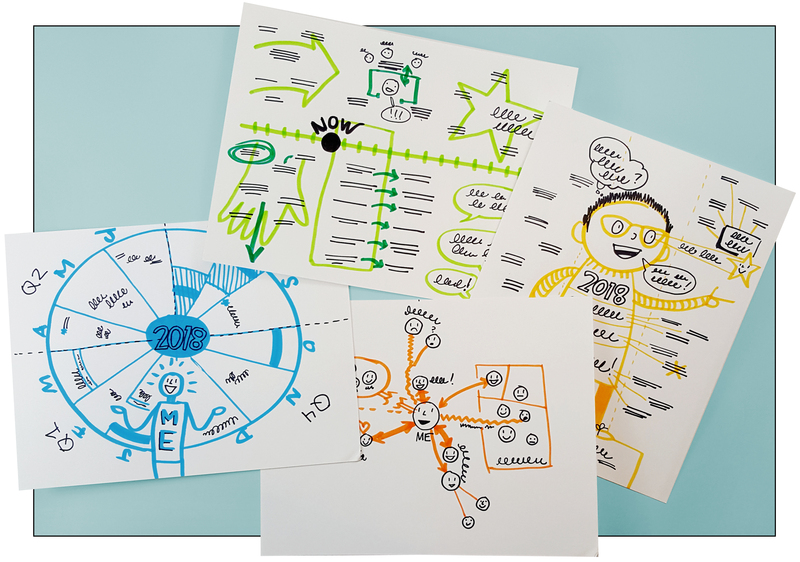 From now until January 28th, 2019, you can get this combination of two visual thinking courses. Get both Draw In Your New Year and The Agerbeck Method for 30% off. Click here to buy Draw In Your New Year for a loved one. Once checkout is complete, you'll receive an email to forward to your recipient with a couple steps to get access to their gift course. Ditch that list of dreaded, forgotten New Year's resolutions. 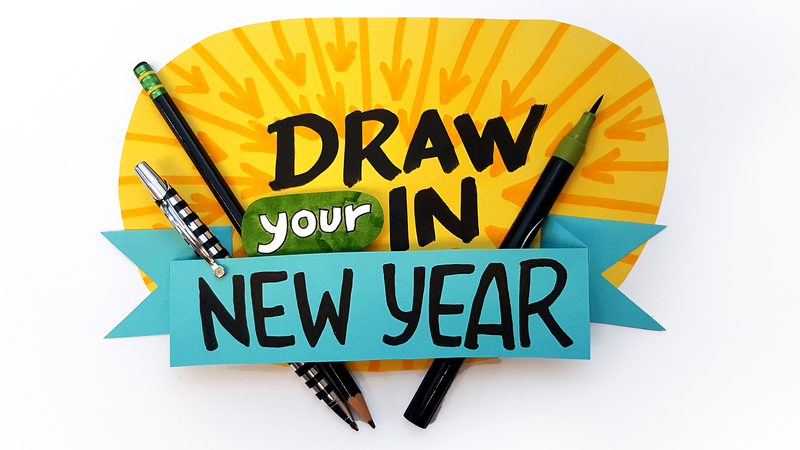 Instead, shape your year ahead with these 4 easy-to-make drawings. Give yourself Draw In Your New Year and the gift of time to reflect and look ahead with paper and pen.